Students onboard the R/V Thompson collect velella velella (by-the-wind-sailors) off the starboard side during the first leg of the expedition. When the Axial Seamount, an underwater volcano, erupted off the coast of Oregon in April, researchers knew within minutes that something spectacular was happening more than 300 miles offshore. Precision hardware installed by the University of Washington last summer let scientists see its effects almost instantly from shore.­­ A team of researchers, engineers and students is now at sea working t­o maintain that equipment and assess the volcano’s aftermath. The cruise — from July 4 to Aug. 7 aboard the UW’s Thomas G. Thompson research vessel — is the first trip to the site since the eruption. The seafloor laboratory, where a cable brings power and the Internet to waters off the Pacific Northwest coast, provides a real-time, virtual eye on the deep sea. 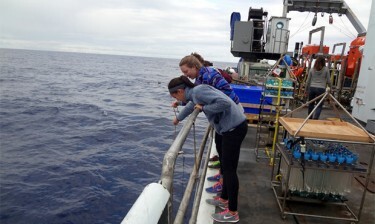 It’s part of the National Science Foundation’s Ocean Observatories Initiative.